Paper is heavy, so it make sense to limit it as much as possible for light travel. While some of the more popular guidebooks now come in electronic format (Rough Guides, Rick Steves) many are still only available in paper. I also prefer paper guidebooks to electronic when I want to take notes or look at the maps. And let’s face it – paper doesn’t need any batteries. So how do you reduce the size and weight of your paper guidebook? By cutting it apart and only bringing the relevant sections! At first I was reluctant to cut up my guidebook. Tearing apart a book felt like desecration. Then I realized that a guidebook is much like a newspaper or a magazine. The information in it is aging and eventually becomes obsolete. 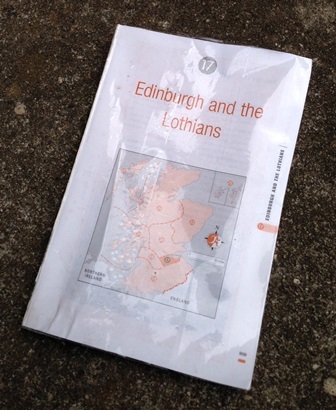 It is OK to cut a guidebook apart – it will be useless in a year or so. I recently found a great post on modifying guidebooks over at the Snarky Nomad (Twitter: @SnarkyNomad). The method requires minimal tools. All you need is a knife and clear packing tape. It took me less than 10 minutes to create the modified guidebook pictured above. Yes, it is that easy. Please check out How to make a guidebook a bajillion times less annoying. Eytan, the author, is a true minimalist traveler. I think you’ll enjoy his sometimes sarcastic and always insightful posts on travel and life in general. Downsizing huge guide books saved tons of packing space on our trip to Spain. We determined what sections we needed then took the bulky book to kinkos. They removed the binding and spiral bound each small section. This worked great. Each city or region we visited we took the section for that area. Lightened our daypack. Some sections we kept others we left behind for the next traveler. We can’t take credit for this, found it on a rick steves forum. I do this too. Instead of tape I use a bulldog clip to keep it together. I keep things even lighter by only putting the pages I need for each day in my bag, and I throw them out when I’m done!